My “oldest” sister (she loves is when I call her that, lol) and I are 18 years apart. I became an Aunt when I was 4, so I grew up pretty close in age to my nieces and nephews. As a result we often did things together. So when my sister started making her kids some sponge painted t-shirts she made some for me too. I specifically remember a cute green one with bunnies on it for Easter. I loved that shirt, one day I’ll find a picture of it and post it on facebook so you can laugh at my bangs. Sponge painted t-shirts were all the rage in the 80’s, but I haven’t seen them around much anymore. So in honor or Throwback Thursday we decided to bring them back! My sister came over and spent the afternoon with us yesterday, we grilled chicken and cobbler and painted T-shirts. It was so much fun! 1. Using cookie cutter, stencils or free hand – draw your shape onto a sponge. Carefully cut the sponge out. 2. Place a large piece of cardboard in between the front and back of the shirt so the colors won’t bleed. 3. Pour a little paint onto your plates. 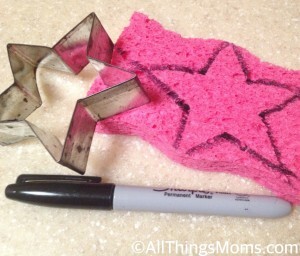 Push the sponge into the paint to ensure full coverage on the sponge shape you are using. I recommend testing your stamp on a piece of paper to make sure it comes out like you would like it too. 4. 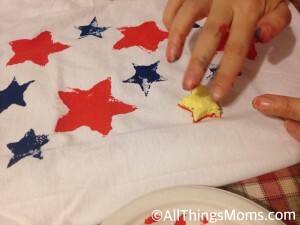 Push the paint covered sponge onto the T-Shirt where you would like the stamp to go. Make sure to apply even pressure. 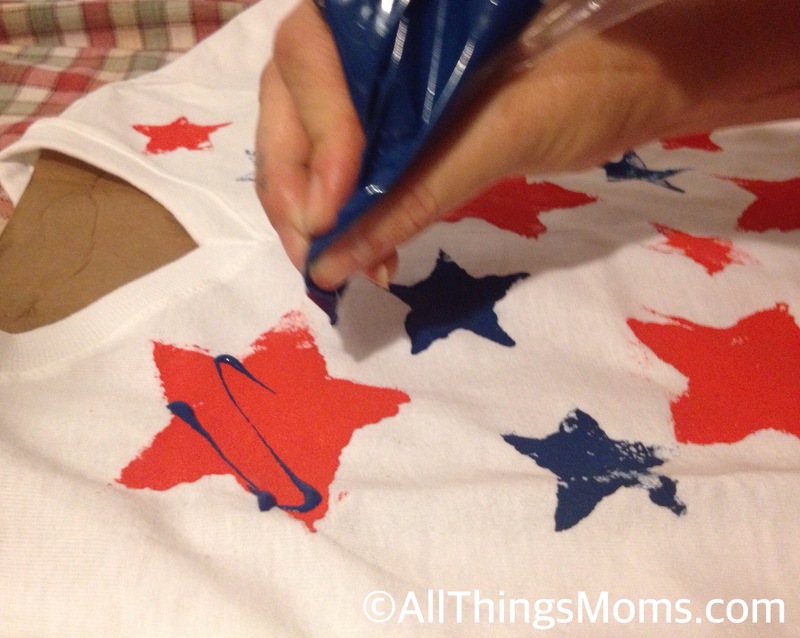 You can also use a Ziploc bag with a tiny hole in the corner to add more details or writing. 5. 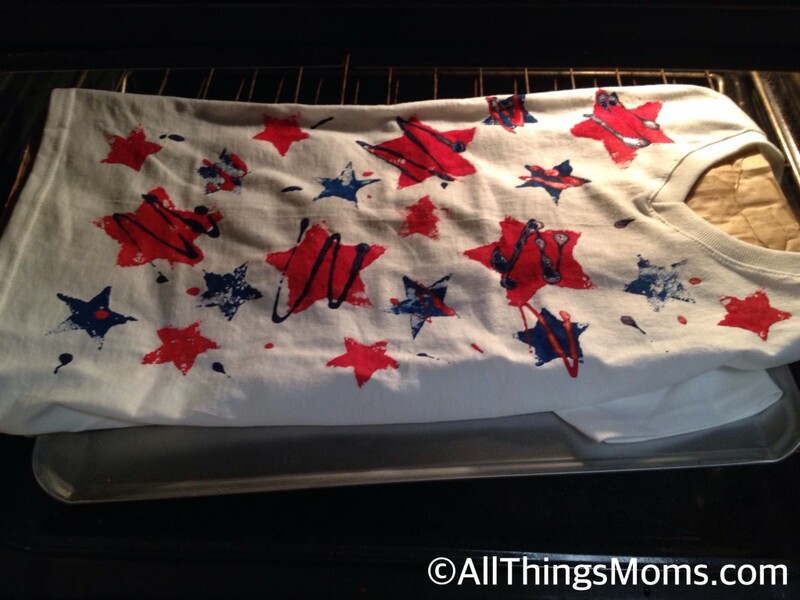 Once you are finished decorating the t-shirt place it in the oven on the lowest setting (170 for my oven) on a clean cookie sheet and bake it for 25 -30 minutes until paint is dry. 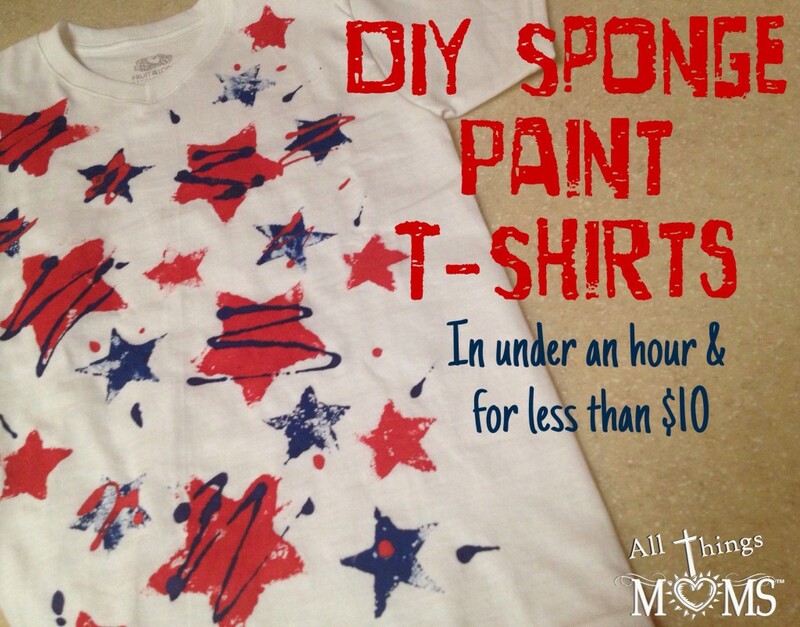 The best part of sponge painted t-shirts is they are easy and inexpensive! 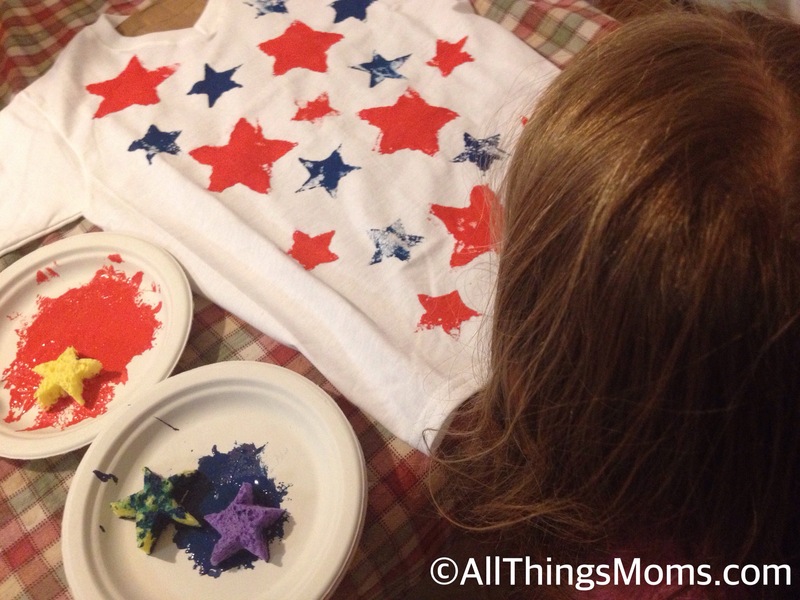 We picked up a T-shirt for under $5, found paints 2 for $1, and got a pack of sponges. Total cost was under $10. Then, depending on how many little helpers you have, you can pull these together in under and hour! We had a lot of fun making this T-Shirt for Boots to wear to the parade Saturday, I know you and your little ones will love it too!